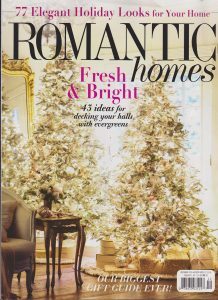 Hello everyone and welcome to our monthly blog hop where we talk styling and design ideas with you! 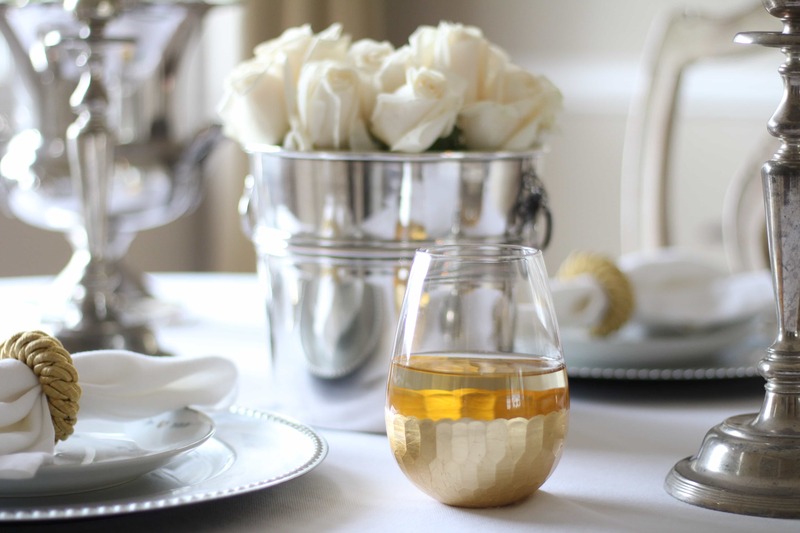 This month we have 10 bloggers participating and we’re all sharing ideas for Valentine’s Day decor and entertaining. 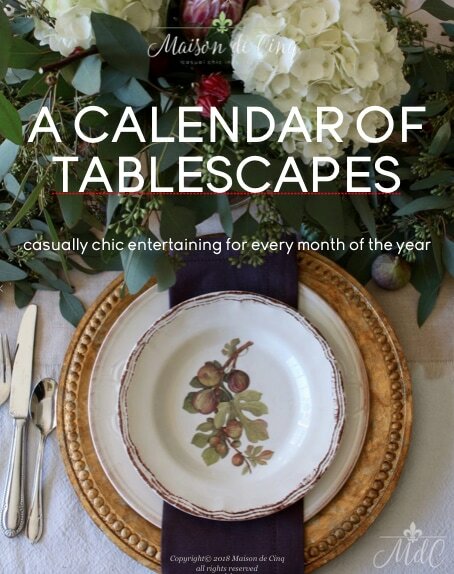 Of course, because I love setting pretty tables, these are often my favorite blog hops to do! 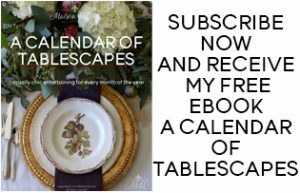 If you love tablescapes, or even if you struggle to get inspired, my free e-book has lots of ideas for tables for every season! 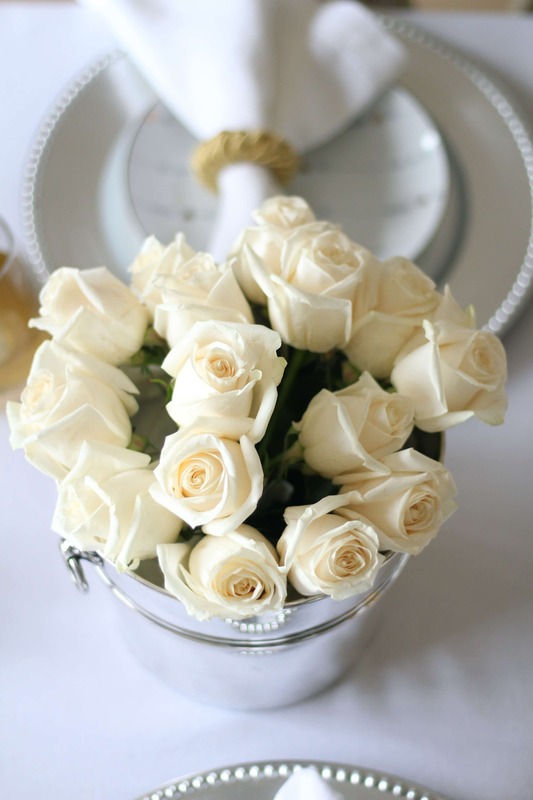 This month I’m sharing a sweet and simple Valentine’s Day table. This is actually my second Valentine’s Day table this month; the first one was a soft pink themed table perfect for a dinner party or even a family celebration. This time, I wanted to do a romantic dinner for a couple. I wanted it to feel soft and sweet, but not too traditional. As I’ve done before, I started with my cute salad plates and the table took shape from there…. I just love these cute salad/dessert plates with the delicate little hearts! When I found them at Williams Sonoma I knew they would be the perfect thing to shape my Valentine’s Day table (similar here). Rather than go with more traditional pinks and reds, I used the silver and gold in these plates as my framework. I love that these colors are a more sophisticated representative of the holiday. The chargers are from Pottery Barn. 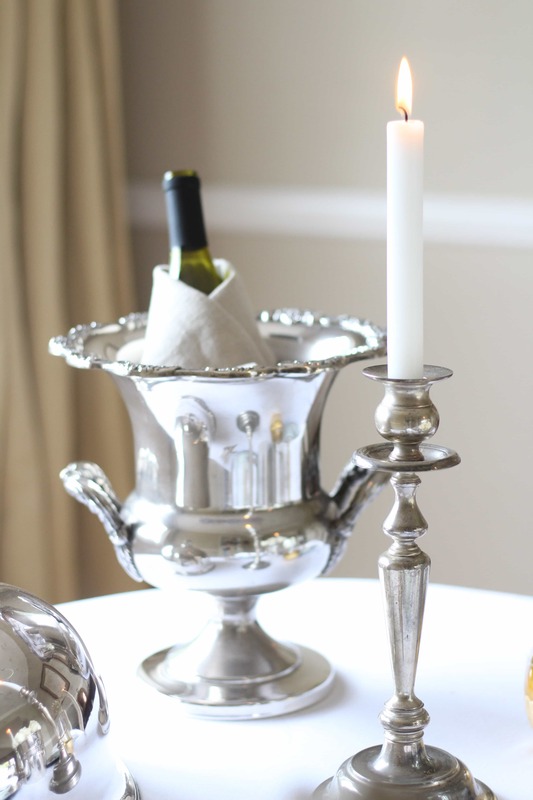 The candle holders, the food dome, and the champagne buckets are all vintage silver plate items that I already owned. 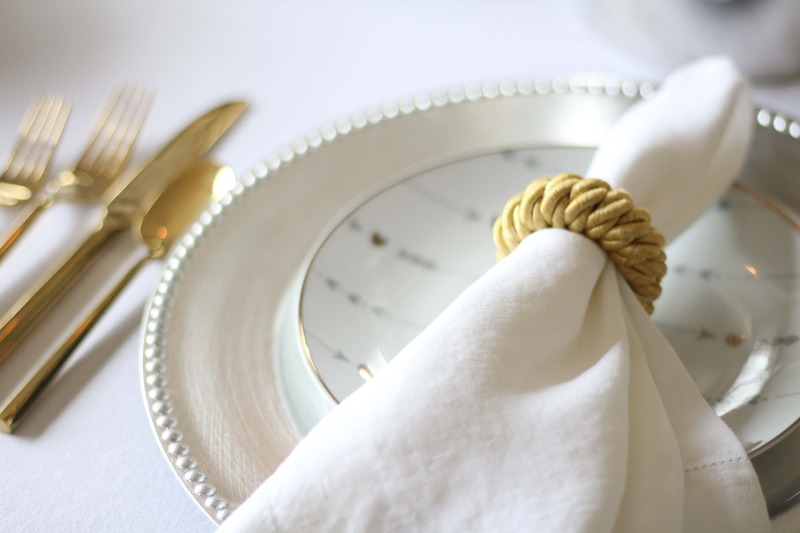 These items combined with a simple white tablecloth and white linen napkins, gave the table the elegance I was looking for. 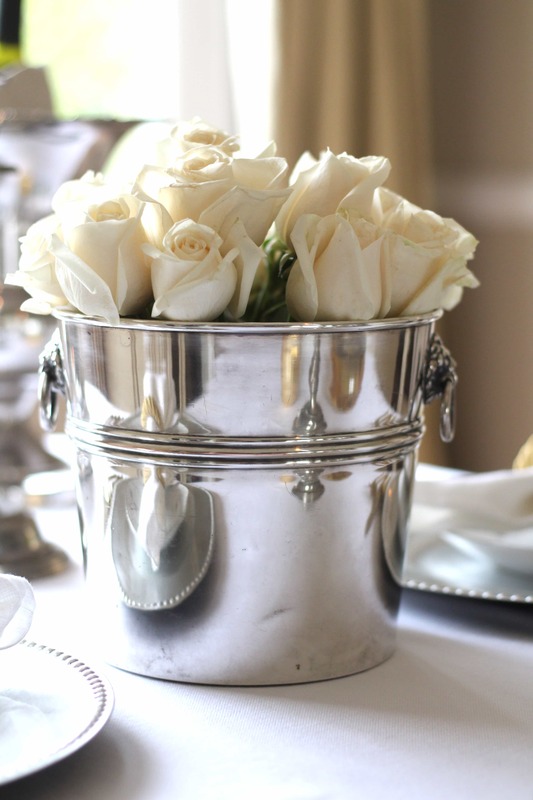 If you’re looking to get some vintage silver plate items, they can be found very cheaply at flea markets and tag sales, as well as estate sales. Sometimes for only a few dollars! I’ve also found some of mine on Etsy and Ebay. Aren’t these glasses fun? I got them as a Christmas gift from a friend and they worked perfectly with the gold and silver theme. I’m loving this gold flatware! I had been wanting some for awhile now as I’ve seen it in so many stores. And though I have quite a few sets of plates, I literally have one set of flatware! I don’t even have anything fancier than my everyday so I thought adding one in a gold color would be a good addition. I’m so glad I did! Thanks so much for stopping by! I hope you enjoyed my sweet and simple Valentine’s Day table, and I hope you’ll sign up for my emails and get a copy of my free e-book, A Calendar of Tablescapes! If you’d like to see my first Valentine’s Day table, you can find that here. 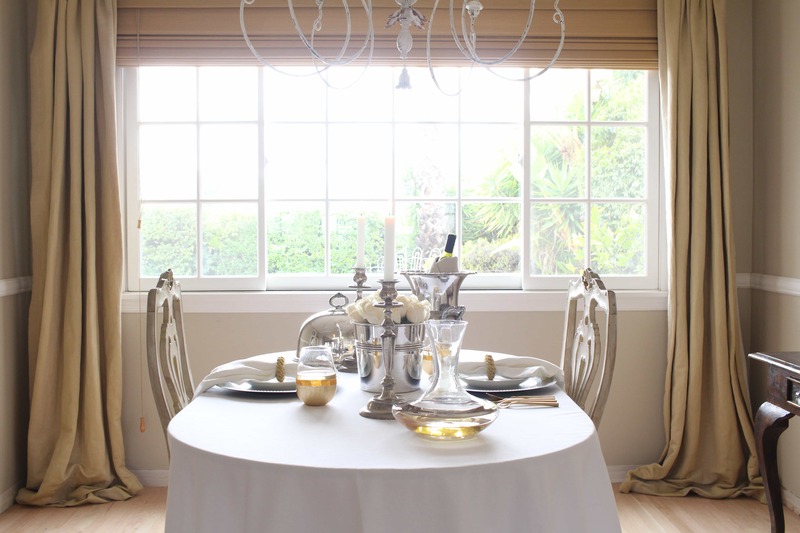 I hope you’ll join us each month as we share different decor and design ideas with you! I’m just getting around to everyone’s blogs! I guess better late. 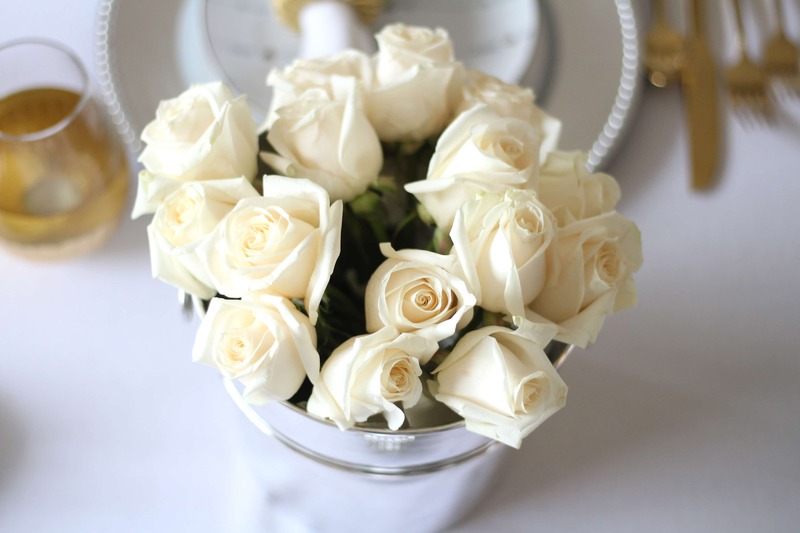 I love your post and your natural decor is so stunning. 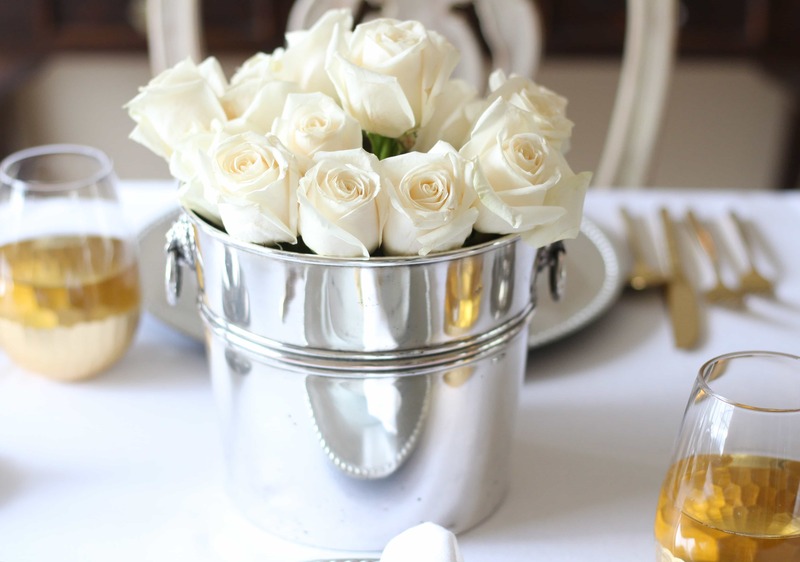 I love the touches of white and your roses are the perfect accent for your table! Thanks for joining us on this month’s fun blog hop! As I mentioned on IG I m in love with those adorable heart dessert plates! So pretty as always! 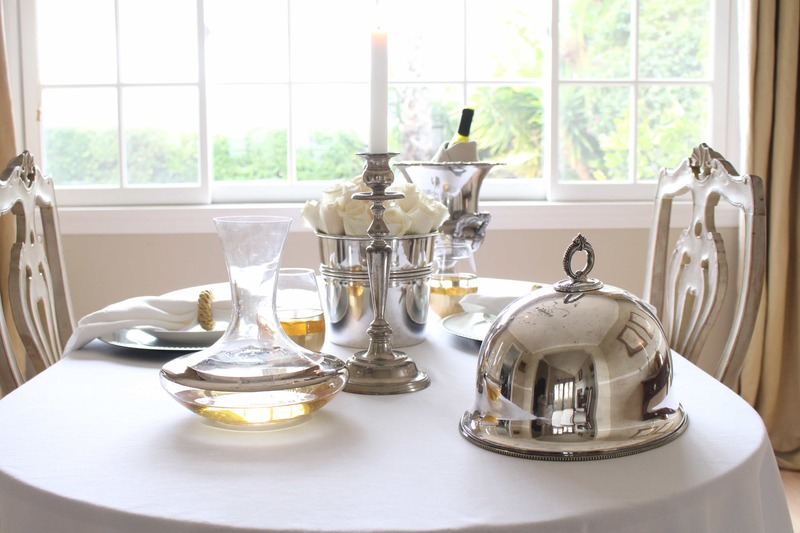 Sheila, your Valentine’s Day table is perfectly elegant and beautiful! I love your metallic touches, and those little gold heart plates stole my heart! Beautifully done, my friend! So glad to be joining you again on this hop! Sheila this is beautiful!!! I love how you used silver,gold, and white! The table looks so elegant and romantic. Gorgeous!!! Love those heart plates! Thank you so much Joan! 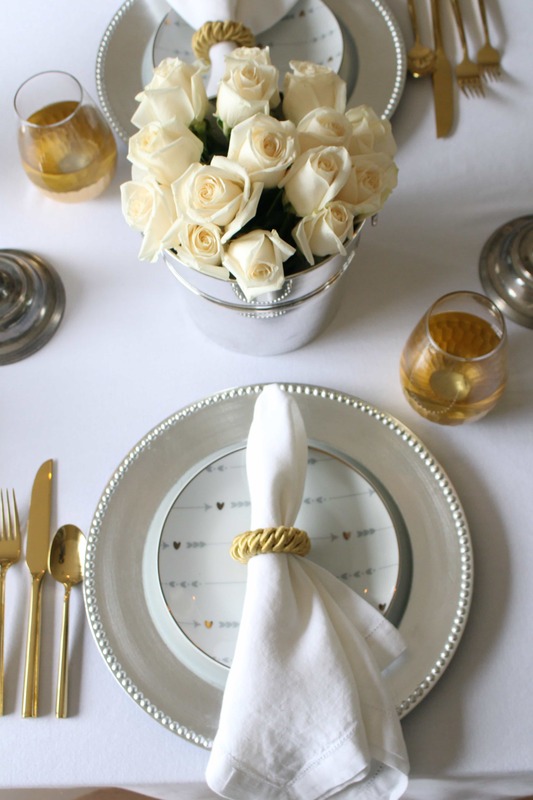 I loved the heart plates – they definitely set the tone for the whole table! Thanks again for your kindness. I’m so happy to be doing our monthly hops with you! Thank you Summer! Love you my friend! Sheila, love this classic elegant look! 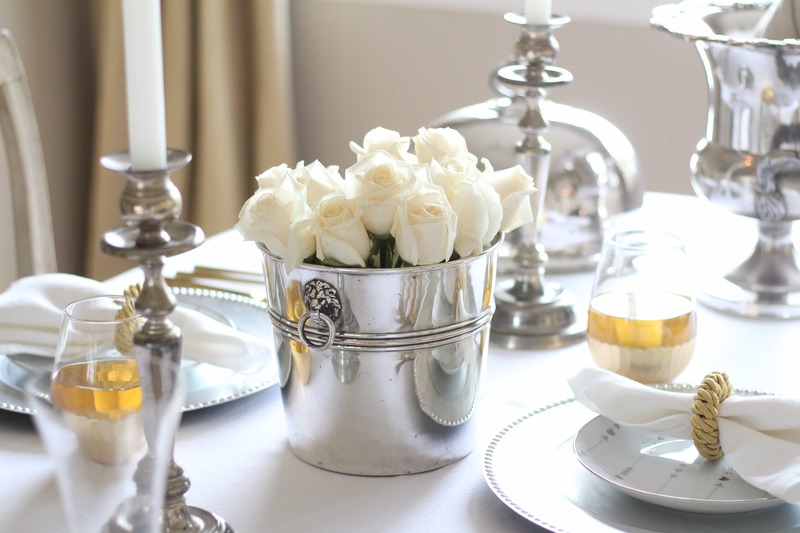 Adore the mix of silver and gold and the use of all your vintage finds- just what we love!! So happy to be teaming up with you again!! Aww.. I love the vintage stuff so much too! And so happy to be joining you girls, always! 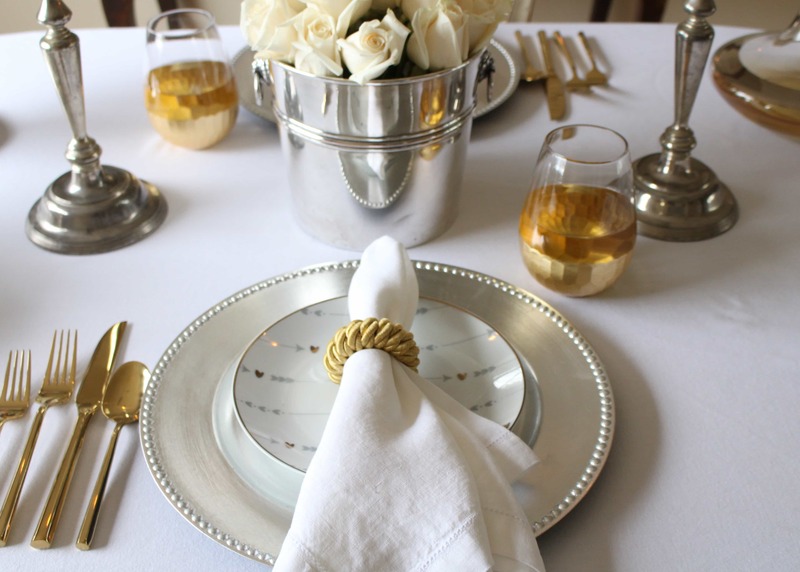 Sheila, I love how you mixed metals, the gold flatware is EVERYTHING! This whole post is just so elegant and romantic! I love it all! Thank you Lacey! 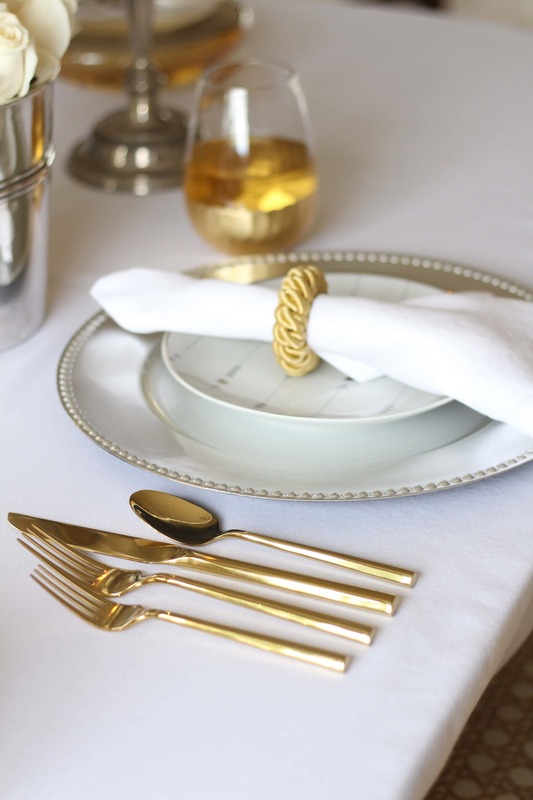 I was wanting some gold flatware soo badly – I think it’s such a great look to add to a table! So glad to be teaming up again!